Arunachal Pradesh BJP general secretary Jarpum Gamlin has resigned from the party’s primary membership on Monday. Jarpum’s resignation came following the denial of the BJP ticket to contest the ensuing Assembly elections in State. The BJP had on Sunday declared the names of candidates for 54 seats in the 60-member State Assembly. Besides, Jarpum, prominent names like ministers Kumar Waii and Jarkar Gamlin were also left out from the list announced by the party on Sunday. 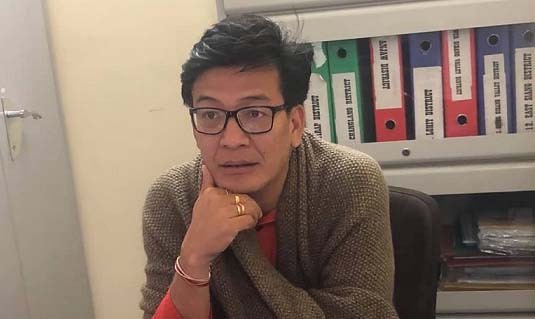 Jarpum in a letter addressed to State BJP president Tapir Gao on Monday said he has decided to tender his resignation from the primary membership of the party as he can’t let down the expectations of his supporters. “For some time now, I have been working closely with the public of 27-Liromoba Assembly Constituency as a contender for the ensuing Assembly elections. The party is well aware of this. However, as the party has announced the ticket which is not in my favour, I am in a precarious position torn between the party and my supporters.” Jarpum wrote in his letter. “After much thought, I have decided that I cannot let down the expectations of my supporters who have reposed faith in me. I have decided, therefore, to resign from the primary membership and all other responsibilities of the BJP assigned from Itanagar, Guwahati and New Delhi,” said Gamlin. Meanwhile, Arunachal home minister Waii has also criticised chief minister Pema Khandu for not giving him ticket for the ensuing polls. He alleged that Khandu had done this because he saw him as a contender for the chief minister’s job. “I am out because the chief minister thinks I am a contender for the CM’s post,” Waii said after not finding his name for the Bameng Assembly constituency from which he won Assembly elections thrice. Moreover, Mahila Morcha’s State in-charge Padmeshwari Jamoh also quit the party on Monday. Jamoh in her resignation letter said that seniority, one’s dedication towards the party and its ideologies has been overlooked by the BJP while selecting a suitable and winnable candidate from the 48-Lekang Assembly constituency. ”A new face that has been in the party fold and someone who does not have dedication towards the ideologies of the party has been offered the ticket. For this, I am left with no other option than to resign,” she said. In other political development, former BJP legislators Pani Taram and Paknga Bage joined the National People’s Party (NPP) on Monday. Assembly and Lok Sabha elections in the State will be held simultaneously in single phase on April 11.